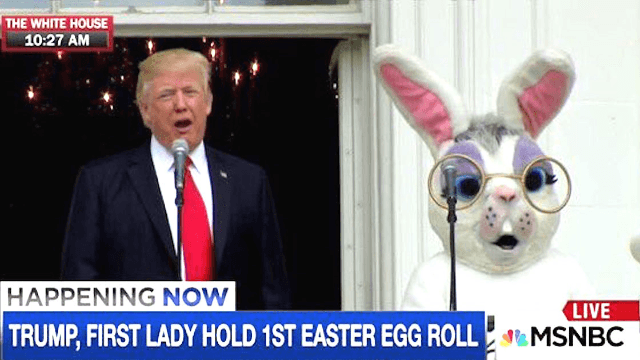 Everything went wrong at Donald Trump's White House Easter Egg Roll. Twitter noticed. President Donald Trump and First Lady Melania Trump hosted their first White House Easter Egg Roll on Monday, to celebrate the day after Easter. President Trump opened the celebration by telling kids and their families that his agenda is moving forward. The First Couple were as happy as ever. People on Twitter wondered why The Day After Easter is the new Easter. Some saw a glimpse of our Hunger Games-like future. Or even scarier: Get Out. Elmo took the opportunity to stand up for PBS. This party is just as well-attended and stacked with celebrities as the inauguration. It's First Lady Melania Trump's big event: she even left Trump Tower for it. Hoping Melania's Easter Egg Roll focuses on some sorta Slovenian Easter Krampus. "Kids, don't let Rabbidus drag you to hell in his pincers!" ...and reminded Donald Trump to put America First. People wondered what else the Easter Bunny could be hiding. Today, we are all the Easter Bunny. What a great preview of what's to come!